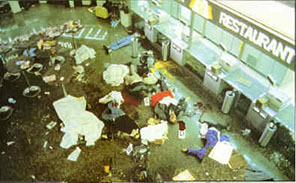 On 17th December 1973, terrorists attacked a Pan Am office at Fiumicino airport, Rome, Italy. 32 people were killed and 50 injured. The assailants then made their way to an American Airlines 707 preparing to take off for Beirut and Teheran. Hurling incendiary devices inside the aircraft, they killed all 29 people aboard and destroyed the plane. Next, they forced five Italian hostages into a Lufthansa jetliner and killed a sixth person, an Italian customs policeman, as he tried to escape. The plane, carrying the hostages, crew, and terrorists, took off and the pilot was ordered to head for Beirut. Lebanese officials refused to allow the plane to land, however, and it flew on to land in Athens. The plane then flew to Damascus where it took on fuel and food during a two-hour stop. Later that day, after landing in Kuwait, the terrorists released their hostages in return for free passage to an unknown destination. On the 27th December 1985 terrorists threw hand grenades and fired Kalashnikov rifles at travellers in the international terminal of Leonardo da Vinci Airport in Rome. Italian police returned fire as bullets rang out across the concourse leaving a trail of blood and broken glass. 16 people died and over 80 were wounded in the attack. At almost the same time, another terrorist team attacked the Schwechat Airport (Vienna International Airport) with assault rifles and grenades, killing 4 people and wounding 47. After interrogating two terrorists still alive after the Vienna attack, Austrian authorities concluded that the terrorists had not intended to carry out a suicide attack, as the police had first assumed, but instead were plotting to take a number of people at the airport hostage, commandeer an airliner and escape in it.